Jason Reiman is the Academy Award nominated director of films such as “Juno”, “Thank You for Smoking”, and the current release “Up in the Air.” He flew in to deliver the keynote speech to a room filled with filmmakers from all around the world. The experience was incredible; Reitman is a very personable speaker and talks on a level that really connects with the younger filmmaking crowd. He talked about growing up in Beverly Hills, his long journey from film to medical school and back to film, and took questions from the audience. Here are just a few of the highlights of what I learned. In order to be a filmmaker, it helps to be the son of a famous filmmaker. Reitman of course, is the son of director Ivan Reitman, famous for helming films such as “Meatballs”, “Twins”, and the “Ghostbusters” movies. 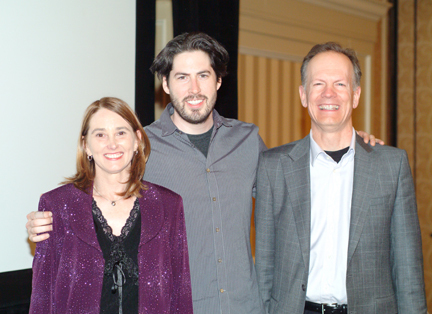 He was speaking tongue in cheek, but Reitman did point out the importance of networking. He was lucky to already be in a circle of Hollywood producers and directors through his father, but just because you’re not doesn’t mean that you can’t meet those people. 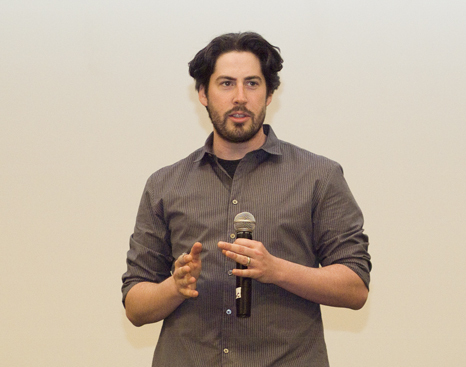 Reitman spoke about the importance of talking to everyone possible at film screenings and festivals, and using social networking to increase your own circle of influence. Write the bad scripts first. Reitman prefers to direct films that he has also written the screenplay for because he really knows the dialogue and flow of the script will work on camera. But he didn’t always write really great stuff. It took him a long time to develop his own style of writing, and he wrote a lot of bad scripts before anything worthwhile came out. An important part of developing writing skills is to really just keep doing it–get your ideas out onto paper, find out what works and what doesn’t, and begin to develop your own voice. Work with people you like. Though Reitman is not the first person to have said this, he stands by this mantra. There are tons of talented people in the world, so don’t stress yourself out by working with talented people who are a pain to work with. Some of Reitman’s regular crew are old high school and college buddies. If you’re doing to be out on a set for 12-16 hours a day, make sure you can stand to be around the people you’re working with. Don’t go for the “cool shot.” Remember that the film is about storytelling, not a showcase for your camera techniques. Reitman and his regular DP like to keep each other in check, joking with each other about the “cool shots for their portfolio” when it looks like one of them may be straying from the storytelling aspect of the film. There is no excuse to not make your film. Filmmaking has never been more accessible as it is now. Reitman recalled the old days when he was starting out and everything was shot on film, making for a time-consuming and expensive editing process. Now you can find a decent digital camera in nearly every big box store or electronics retailer you walk in to. All you need is a story, a camera, and a basic editing software. Reitman himself scrounged the money for his first film by selling desk calendars to his college. He challenged the filmmakers to stop making excuses and just go out and make your film with what you have. Watching Reitman speak was in itself worth the trip to Las Vegas. 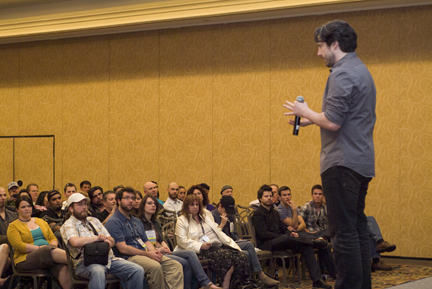 He was insightful and inspiring, as well as encouraging to all of the filmmakers present. I’ll look forward to continuing to watch his great films, and will hope for that Academy Award sometime in the near future.